Both the original Star Wars trilogy and the prequel Star Wars trilogy have their own strengths and weaknesses. The original trilogy is highly inventive, telling uniquely plotted stories on a grand scale, but it's now visually dated. Granted, this wasn't a flaw back when it was originally released and arguably shouldn't be considered a flaw today, but it's difficult to ignore when marathoning the franchise. Alternatively, the prequel trilogy benefits from exciting visual design and special effects that are fresh and enjoyable (if massively overused), yet these films fail in terms of storytelling; character arcs are squandered and big moments ultimately fall flat. So what happens, I ask you, when you get a Star Wars film that is visually breathtaking, and packs the perfect amount of narrative weight and character development. The answer? Well, it might look a little something like The Force Awakens. 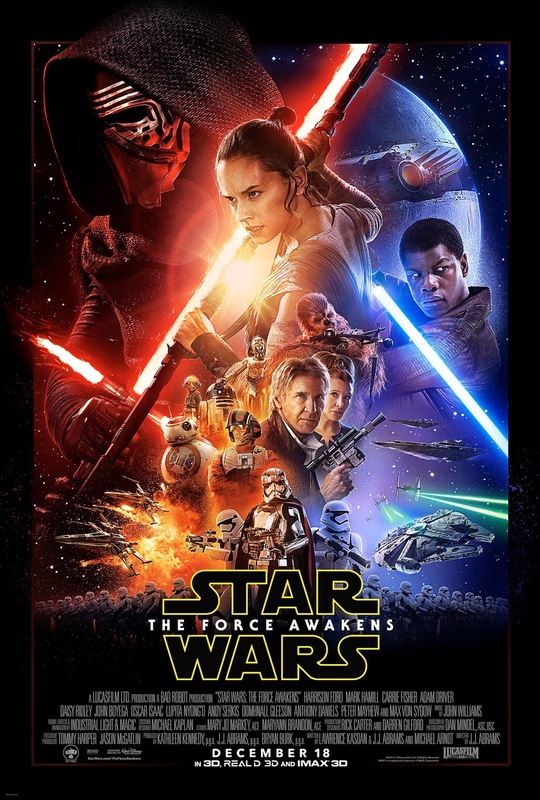 There are no doubts about it that The Force Awakens is a magical film experience. It is exciting, it's brave and it's nostalgic all at once. Perhaps the film's greatest strength is the simplicity of its storyline, after all it's been noted many times that one of the biggest divides between the original trilogy and the prequel trilogy is the ways in which they handle plot. The Force Awakens seems set to be following the ideas and structures of the original trilogy, but with enough differences to stand apart. Well, mostly. The Force Awakens is very good at being nostalgic, with characters and iconography like C-3PO and the Millennium Falcon given memorable entrances, but it does perhaps wander dangerously near parody territory. The base premise is very similar to that of original film A New Hope, and we even have small sequences that are almost ripped straight from previous films. It was important that this film discusses its past, I know, but it pushed it slightly. That said, it doesn't really detract much from the film at all, it's just a mild niggle floating around inside a terrific new instalment. What actually does set this film apart, though, is its characters. Each of the new leads are handled excellently, and played fantastically well by all involved. Daisy Ridley's Rey is a likable heroine who develops really nicely across the film, and Ridley injects her with a great deal of fun in the moments that require it, yet also manages to portray the horror and anguish that Rey suffers in the film's excellent final act. John Boyega's Fin fares equally well, acting as one of the film's funniest characters but never losing sight of who he is and where he comes from. Boyega is terrific throughout, allowing his comedic roots to flourish nicely but effortlessly retaining the darkened past that Fin has due to his former life as a Stormtrooper. And then we have Adam Driver, playing the film's villain: Kylo Ren. This film belongs to Kylo Ren. Originally a man behind a mask with a frighteningly deep voice, Ren is intimidating in his sheer ferociousness as he uses the force to hold back lasers mid-air, or angrily attacks parts of a ship to vent his frustration. Yet it's when he takes the mask off that he truly becomes the film's villain. His humanity is strengthened, he alters from being your simple masked bad guy to a person who has descended into madness and evil, and Driver sells this perfectly. Ren begins the film barking orders at Stormtroopers and such, but in the final act he becomes something truly formidable. I would go as far as saying he is the greatest villain this franchise has ever produced. We also have BB-8 who is essentially a gift from the Gods, and quite possibly the funniest thing this franchise has ever done. Where can I get one? Whilst the cast are all standouts on their own, the bulk of the credit for this film must lie with JJ Abrams, who has pieced together a film that can proudly stand besides the franchise's greatest. His reliance on props and old school shooting techniques allow the film's world building to excel, within mere minutes Jakku feels like a planet we all know and understand. Rey's lifestyle becomes apparent very early on in the film, but it's the props and general visual style that really emphasis how she lives. When the Stormtroopers attack a small town early on in the film, the lack of CGI fully allows the brutality of this scene to come across. The film feels fully grounded in reality, but has this magical ability to soar through the sky whenever it wants to. Abrams' story, too, is nicely simplistic. There's no over complication here, no sudden detours into irrelevant subplots. Abrams picks his story very early on, and the film's rapid pacing allows us to be hurled into the middle of things before we know it, and the film never loses its focus from there. By using a simplistic story, Abrams has found plenty of room to inject the characters with small moments that powerfully develop them, as well as creating enormous space for comedy. I was really taken aback by how funny The Force Awakens is, it's far and away the funniest entry of the franchise and that it achieves this without ever sacrificing story, character or thematic content is a testament to how good Abrams script is. What makes this film so magical, though, is its wonderful sense of nostalgia and how it treats the previous six films. This is event cinema, after all, and the film knows it. The Millennium Falcon reveal is unexpected and brilliantly funny, gaining cheers from the audience. C-3PO's entrance to the film is spot on in terms of his character. Han Solo and Chewbacca's return is handled excellently, and typical Star Wars lines are uttered in the perfect places. The Force Awakens is very safe in its first half, telling a familiar story in a very familiar way, but it's the film's final act where everything truly becomes spectacular. Enormous risks are taken, the film's tone darkens considerably, and we have one of the most brutal and intense lightsaber duels this franchise has ever offered. If the film's first half is all about magic and nostalgia, this is dropped in the latter half when The Force Awakens finally breaks free from the past, and becomes its own film entirely. And the icing on the cake? This is only film one of a whole new trilogy. Next up in the director's seat is Rian Johnson, of Looper and Breaking Bad's Ozymandias fame. Abrams lays all the groundwork for a superb trilogy, and by the end of the film he has pushed everything off in the right direction. It may be a year and a half away, but I'm counting down the days already. Star Wars is back, and boy is it good again. To Summarise: Both refreshing and nostalgic in equal measure, and packed with assured performances from a terrific cast, The Force Awakens brings the Star Wars franchise soaring back to life in an exciting, emotional and action packed way.